Why waxing your underarms will change your life! Everyone has those moments in life where you faced with making life-changing decisions. What career you will study, who you choose to marry, will you have children, where you will live etc etc. Somewhere amongst that list of life changing decisions is whether or not you will wax your underarms (yes clearly that decision is on the same level). You may question this but trust us, waxing your underarms WILL change your life. Many of you may not realise it yet and happily trust that your razor is leading you down a happy and prosperous road. But you know the saying the grass is always greener on the other side? Well in this case the grass is most definitely greener, it stays greener for MUCH longer and not to mention a lot smoother and less bumpy – you see where we are going with this? There is nothing worse that when summer rolls round and you have to shave your underarms every second day because you have stubble quicker than you can say ‘I’m going to the beach.’ Or on second thoughts, maybe you are one of the extra lucky ones who experience the amazing aftermath of shaving rash; instead of silky smooth underarms, you have red, bumpy, sore pits that may as well still be hairy, because let’s be honest, you are not going to let them see the light of day anyway! Waxing your own underarms is super easy and you only have to do it once to totally jump on board the waxing train. With a few quick strips you can have hair-free armpits for up to 4 – 6 weeks. The first few times you wax you may find it slightly uncomfortable and feel a slight sting but once you see the results you will not look back. You can say goodbye to skin irritations, painful bumps and small nicks appearing on your delicate underarms. Now doesn’t that sound like an absolute life changer! Here’s Waxaway’s Top 5 Tips for waxing your underarms. Clean machine: Prior to waxing, make sure your underarms are completely clean and dry. Have a shower a couple of hours before you plan on waxing and skip the deodorant completely as it will affect how the wax adheres to the hairs. Let it grow, let it grow: Letting your underarm hairs grow to a length they can be waxed takes a little bit of self-control. Despite what many people think, hairs do not have to be extra-long in order to be waxed, they can be as short as 2mm. Think of those couple of days where you can see those tiny little hairs as a minor sacrifice for the greater good of your underarms. Not having to think about it again for 4-6 weeks is worth it. One Direction Vs Two Direction: While some people may be lucky enough to have all their hairs growing in the same direction, most people will find with the bottom half of their underarms the hairs will be growing downwards, where as the top half of their underarms the hairs will be growing upwards. With waxing you need to apply the wax in the same direction as the hair growth and remove by pulling the strip back in the opposite direction as close to the skin as possible. This means it is best to approach your arm pit in two sections to make sure you are always removing the wax in the opposite direction of hair growth. A little bit of TLC: Immediately after you have waxed you may experience some redness and slight discomfort. This will subside quickly. Show your armpits a bit of tender loving care by using an after waxing lotion to soothe the skin. Make a commitment: Regular waxing will lead to hairs growing back slower and finer making waxing even easier than it was to start with! Whatever you do, DO NOT shave in between. 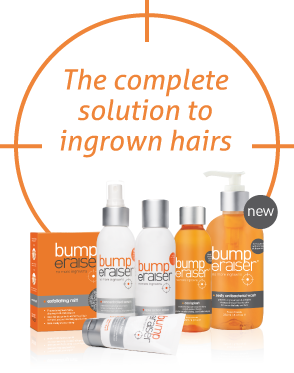 To get the best results from waxing you need all your hairs to be growing at the same rate, shaving in-between completely throws your hair growth cycle off. It’s time to give your razor the complete boot and make a commitment to waxing so you and your underarms can live happily ever after!